Here we highlight the amazing students, faculty, and staff at New Hampshire’s community and non-residential colleges! Have a news article you’d like to share? Email csappnh@gmail.com to have your story added to this page! Safiya Wazir fled the Taliban in Afghanistan in 1997. She became an American citizen in 2013 and earned a business degree at NHTI, Concord’s Community College in 2016. Recently, Wazir won the Democratic primary for a state house seat in a stunning upset. White Mountains Community College held its seventh annual STEM Camp this summer. The camp is designed to allow 6th through 8th grade students to explore the unique aspects of Science, Technology, Engineering, Mathematics, and Health professions. 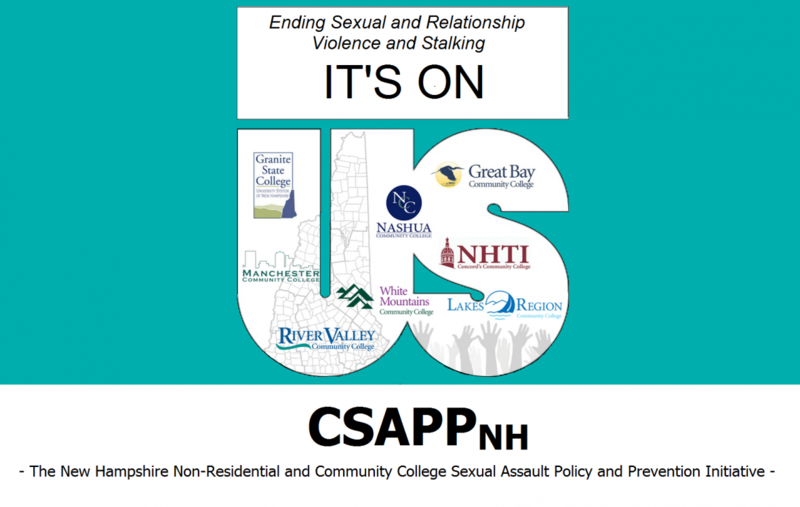 Granite State College introduces the free smartphone app, uSafeUS, to its students. The app contains ways to prevent sexual assault including interactive features, helpful answers, and campus-specific resources. On September 8th, 2018, New Hampshire Technical Institute will host a daylong conference on “Mindfulness in Society”. At this conference, there will be nationally known people speaking, and workshops on mindfulness, meditation, politics, education, and business. HRCU awarded Alyssa Lavertue with a scholarship in recognition of her successful completion of The Banking and Financial Support Services, of HRCU’s SHS program, with a grade of “A” over two semesters. She will be attending Great Bay Community College this fall. A number of younger candidates are running for office in the upcoming election, including 1 students who has graduated from a New Hampshire community college, Andrew Bouldin, who earned his degree in Information Systems Technology at Great Bay Community College. His top three issues are the opioid epidemic, education funding, and unions and collective bargaining rights. In partnership with the Conway Area Humane Society and area veterinary hospitals, White Mountains Community College will begin its new Veterinary Assistant Program this fall. This program provides opportunities for students to use their clinical skills in a number of settings. The Registered Apprenticeship Program for Home Health Aides at Great Bay Community College in Portsmouth is a community college training and apprenticeship program for home health aides. It is free to students and is poised to become a model for attracting new workers to home care. Kelsey Gross will attend Great Bay Community College in the fall after receiving her high school diploma at the Exeter Adult Education graduation. She could not attend college originally because she became pregnant her senior year of high school, but now, she is excited to earn her college degree from Great Bay, saying, “It took a lot to get here and I had to push myself. I’m happy, I’m excited, and I’m glad I made it”. Congresswoman Annie Kuster released her jobs and opportunity agenda at Nashua Community College. The legislative agenda will support job training and apprenticeship programs, workforce development, improving college affordability, and fostering small business growth. Granite State College makes number 15 for the list of the 25 best bachelor’s in special education online degree program for 2018! Marine Corp veteran from Hampsted, Jeremy Clague exited Sullivan Arena at St. Anselm College with a degree in hand following Manchester Community College’s 72nd commencement ceremony. Nicole Van Coppenolle took a bookkeeping class at Granite State College and hopes to pursue an accounting degree after completing this class! She and her son were homeless for 7 months, but she is now trying to help others who are struggling with homelessness to pursue a college degree. ‘Swing into Spring’ is the Nashua Community College’s largest fundraiser, using the money raised for the school’s scholarship fund to help make college education ‘accessible and affordable for all students’. New Hampshire’s seven community colleges prove themselves highly agile in meeting the changing needs of New Hampshire student’s economy and workforce. Some of these needs include affordability of postsecondary education, pathways to in-demand careers, and high quality programs which have a focus on student retention and success. Representatives of the National Governors Association Center for Best Practices familiarize themselves with the opportunities students in the Capital and Lakes Regions have with work-based learning programs. Some students in the Lakes Region Community College automotive program get sponsorships from automobile companies, and a job at a dealership will await them upon graduation. Colby-Sawyer College celebrates the 25th year of its Clothesline Project exhibit. This exhibit is a way for survivors to come together and share their stories of sexual or mental abuse. This year there was about 7,000 shirts displayed! The Clothesline Project is also at other New Hampshire schools such as Great Bay Community College in Portsmouth, Rivier University, New Hampshire Technical Institute, and Plymouth State University. Bridges has won the 2018 Presidents’ Leadership Award! The award, sponsored by Nashua Community College, is given to a community organization who has enhanced the quality of life in the community of meaningful and measurable ways and has engaged in the development of sustained, reciprocal partnerships with a college or university. White Mountains Community College forms a task force called “#ItsOnUsWMCC”, which is comprised of students, faculty, and staff. It represents WMCC’s three local domestic and sexual violence crisis centers. “It’s On Us” is a national campaign launched in 2014 by the White House Task Force to Protect Students from Sexual Assault. According to trauma specialist, Linda Douglas, how law enforcement officers respond to a disclosure of sexual assault can deeply affect the survivor’s healing process. Many of these crimes are not reported, however 1 in 5 women and 1 in 16 men are sexually assaulted while in college. The US Department of Health and Human Services Office on Women’s Health awards nine cooperative agreements of approximately 2 million dollars a year, for three years. One such cooperative participant is the University of New Hampshire! This funding goes towards raising awareness for sexual assault prevention on college campuses.